Spider sets the standard for UAV (Drone) safety and operational preparedness. We work closely with the Civil Aviation Authority (CAA) and other governing bodies to ensure that we are in full compliance with their regulations. The drone industry is a fast changing environment technically and with regard to regulation. With our help the CAA and the European Aviation Safety Agency (EASA) are currently working to provide a better standard for drone operators worldwide. Spider was the first foreign operator of drones to work in France as well as Spain. We worked closely with the Ministere du Developpement durable (DGAC) in France, as well as the Agencia Estatal de Seguridad Aerea (AESA) in Spain to gain permissions to legally work within their airspace. We currently operate in: UK, France, Northern Ireland, Balearic Islands, Spain, Italy, Croatia, Germany, Greece and Malta (We're adding new countries every month). Among one the many of Spider’s accomplishments there are a few stand out. Most notably, Spider has flown one of our large drones on the set of StarWars and out of the Bow Room of Buckingham Palace. This is a great example of our level of professionalism and ability. Other sites that Spider has flown include Blenheim Palace, Highclere Castle, Banburgh Castle, London City Centre, Glasgow City Centre, Edinburgh City Centre, Bristol City Centre, Birmingham City Centre, Manchester City Centre and many other cities around the world. Spider’s Managing Director, Ben Sheppard, has 25 years of experience flying drones, radio controlled vehicles and robotics fabrication. 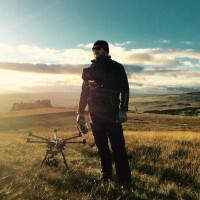 Spider’s Operations Director, Mike Bishop, has 15 years of experience flying drones and has a vast knowledge of the electrical systems on the aircraft that ensure they are technically sound. Rogue One: A Star Wars Story is an upcoming American epic space opera film directed by Gareth Edwards and written by Chris Weitz and Tony Gilroy, from an idea by visual effects supervisor John Knoll. It will be the first stand-alone Star Wars Anthology film. Set in the Star Wars universe some time after the events of Star Wars: Episode III – Revenge of the Sith and shortly before the events of Star Wars: Episode IV – A New Hope, the story will center on a group of Rebel spies on a mission to steal the plans for the Galactic Empire's new weapon, the Death Star. It will star Felicity Jones, Diego Luna, Ben Mendelsohn, Donnie Yen, Riz Ahmed, Mads Mikkelsen, Alan Tudyk, Jiang Wen and Forest Whitaker. Downton Abbey is a British-American historical period drama television series created by Julian Fellowes and co-produced by Carnival Films and Masterpiece. It first aired on ITV in the United Kingdom on 26 September 2010, and on PBS in the United States on 9 January 2011 as part of the Masterpiece Classic anthology. The series, set in the fictional Yorkshire country estate of Downton Abbey between 1912 and 1925, depicts the lives of the aristocratic Crawley family and their domestic servants in the post-Edwardian era—with the great events in history having an effect on their lives and on the British social hierarchy. Such events depicted throughout the series include news of the sinking of the RMS Titanic in the first series; the outbreak of the First World War, the Spanish influenza pandemic, and the Marconi scandal in the second series; the Irish War of Independence leading to the formation of the Irish Free State in the third series; the Teapot Dome scandal in the fourth series; and the British general election of 1923, the Jallianwala Bagh Massacre, and the Beer Hall Putsch in the fifth series. The final season introduces the rise of the working class during the interwar period and hints towards the eventual decline of the British aristocracy. Downton Abbey has received acclaim from television critics and won numerous accolades, including a Golden Globe Award for Best Miniseries or Television Film and a Primetime Emmy Award for Outstanding Miniseries or Movie. It was recognised by Guinness World Records as the most critically acclaimed English-language television series of 2011. It earned the most nominations of any international television series in the history of the Primetime Emmy Awards, with twenty-seven in total (after two series). It was the most watched television series on both ITV and PBS, and subsequently became the most successful British costume drama series since the 1981 television serial of Brideshead Revisited. By the third series, it had become one of the most widely watched television drama shows in the world. On 26 March 2015, Carnival Films and ITV announced that the sixth series would be the last. It aired on ITV between 20 September 2015 and 8 November 2015. The final episode, serving as the annual Christmas special, was broadcast on 25 December 2015. Although there are no plans in place, there are strong rumours of a future film adaptation, with executive producer Gareth Neame saying that he was "very interested" and bookmakers Ladbrokes stating that "it only looks like being a matter of time before the film is released". Charlie Luxton embarks on a nationwide journey to visit some of Britain’s best homes by the sea and find out what makes the perfect coastal property.